View, print and convert PLT, HPGL/2, DWF, CGM and PDF files. ViewCompanion Standard is an application for viewing, printing and converting plotter files generated by your CAD program or plotter driver. ViewCompanion can open PLT plotter files using HPGL, HP-GL/2, KIPGL, HP-RTL and Calcomp formats. In addition to plotter files ViewCompanion can view, print and convert Adobe PDF, CGM, Autodesk DWF and Gerber files. Adobe PDF, Autodesk Drawing Web Format (DWF) and Scalable Vector Graphics (SVG) are all very useful and popular formats for distributing drawings on the Internet. ViewCompanion can convert your PLT, Gerber, CGM and DWF files to Autodesk DXF format which you can read in any major CAD application. Use ViewCompanion to annotate your files with markup elements like stamps, revision clouds, text notes, dimension lines, area measurements, barcodes, symbols, images and more. All markup elements will be stored in a separate file and the original file will not be modified. to see more screenshots in full size. View, print and convert PLT, HPGL and HPGL/2 files. View, print and convert Autodesk DWF, CGM, Calcomp and Gerber files. View, print and convert Adobe PDF files. Convert your files to PDF, TIFF, CALS, DWF, DXF, PNG and other formats. Add markup using lines, text, images, polygons, symbols, stamps, dimension lines, measurement areas and more. Add footer and header containing date, scale, time and filename when printing. Add watermark using either text or a raster image during printing. Poster mode for printing big format drawings on multiple paper sheets. Print in n-up mode, also known as multiple pages per sheet printing. Batch print and batch convert all supported format. Create password protected PDF and DWF files. Use mouse-wheel for zooming and panning operations. Choose between ribbon, or a classic menu and toolbar based user interface. Supports multipage PLT, HPGL/2 and DWF files. Send a file directly to an other person using E-Mail from within the program. 1. With Standard you may convert PDF files to the following formats: TIFF, CALS, GIF, HP-RTL, JPEG, PCX, WebP and BMP. 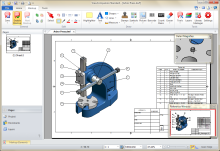 You will need the Premium edition to do PDF to CAD conversion, e.g. : PDF to DXF. 2. Can open CGM files using binary and clear text encoding. No additional applications or drivers are needed for conversion to the different formats.